The first two lines of the table above shows the return of all Bireme client accounts net of accrued fees at the indicated level. Bireme charges a 1% management fee and a 10% performance fee for qualified clients. We prefer to charge performance fees to better align our incentives with our clients' interests, but SEC rules only permit advisors to charge performance fees to certain clients. For clients who aren't qualified, we charge a 1.75% management fee with no performance fee, which we view as roughly equivalent in expectation. Learn more about our fees here. The table then compares client account returns to two different benchmarks: the synthetic benchmark, comprising the performance of competing passive investments, and the ARC Private Client Index, comprising the performance of some of our wealth management competitors. By comparing the performance of their account to these benchmarks, we allow clients to objectively assess Bireme's added value. 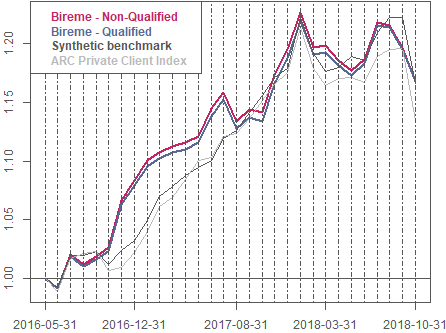 The synthetic benchmark serves as a hypothetical proxy for the performance of client investment portfolios had they not invested with Bireme. Each client gets their own individualized synthetic benchmark, constructed from an investment in underlying strategy benchmarks proportional to that client's unique allocation bands. The ARC Private Client Index is a third-party estimate of the performance results of competing wealth managers. We've included this index of our competitors for the sake of completeness and transparency, but we think our synthetic benchmark is a more accurate benchmark. There are four APCIs for varying levels of world equity risk. For this comparison, we use the Steady Growth index, corresponding to 60-80% equity risk, which most closely corresponds to the dollar-weighted average exposure of Bireme clients to our two equity strategies over this period (60.6%). Does your current wealth manager show your account performance and an appropriate benchmark side-by-side? By using synthetic benchmarks at Bireme, we hold ourselves to a tough and transparent standard. We think others should too. For more detailed results, including a breakdown by strategy, please contact us. The information contained herein is general information and not intended to offer investment advice. Advisory fees and other important disclosures are described in Part 2 of Bireme's Form ADV. The performance in the table is the performance on a dollar weighted average of the securities in all Bireme accounts ("Bireme Master Account") and the strategies that make up the account holdings from inception 6/6/2016 through 10/31/2018. Past performance is not indicative of future results. Changes in investment strategies, contributions or withdrawals may cause the performance results of your portfolio to differ materially from the performance displayed. Different types of investments involve varying degrees of risk and there can be no assurance that any specific investment will either be suitable or profitable for a client’s investment portfolio. It is not possible to invest directly in an index. Index performance does not reflect charges and expenses and is not based on actual advisory client assets. Index performance does include the reinvestment of dividends and other distributions. The performance is shown as net of a 1.75% advisory fee with no performance fee for non-qualified clients, and net of a 1% advisory fee and a 10% performance fee for qualified clients. Returns are shown net of fees at the account level, and gross of fees at the individual strategy level. For current performance information, please contact us at (813) 603-2615. Bireme Capital LLC is a Registered Investment Advisor in the Commonwealth of Pennsylvania and the State of Connecticut. Registration does not constitute an endorsement of the firm nor does it indicate that the advisor has attained a particular level of skill or ability. ARC Private Client Index (“APCI”) results are provided by Asset Risk Consultants. APCI is a performance estimate based on the aggregation of investment returns of discretionary private clients with a minimum account size of $350,000, as reported by participating investment managers. APCI returns are based on account level performance, as opposed to the performance of each security held in the account. APCI data includes returns from clients served by non-US and non-SEC registered investment advisors. More information be found at www.assetrisk.com. APCI data starts 5/31/2016. There are four APCIs for varying levels of world equity risk. For this comparison, we use the Steady Growth index, corresponding to 60-80% equity risk, which most closely corresponds to the dollar-weighted average exposure of Bireme clients to our two equity strategies over this period (63.1%).